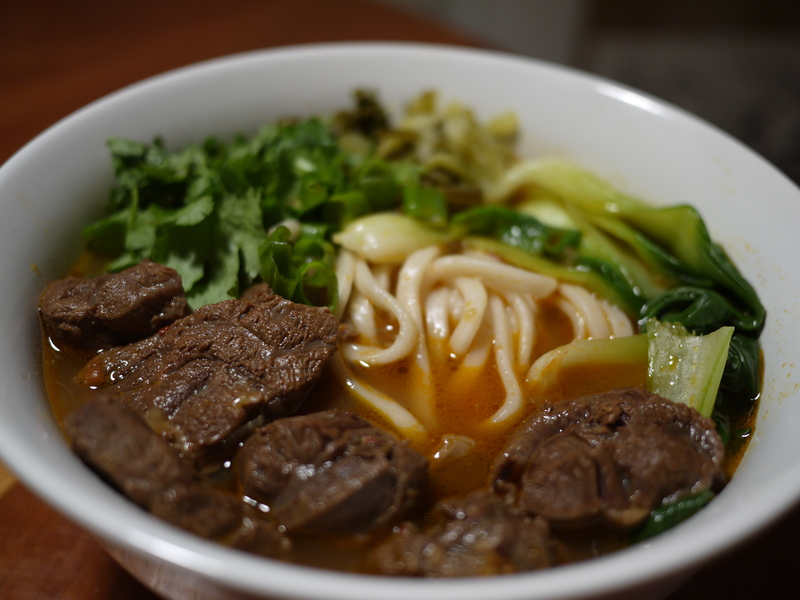 since there aren’t decent places to get beef noodle soup in chicago, i decided to make niu rou mien (or as my friend kent would call it, NRM) this past weekend for ben. plus, it also gave me another excuse to use a pressure cooker. i found this awesome, easy-to-follow recipe from Tasty Meals at Home and more or less replicated it. Fill a 6-quart pressure cooker halfway full of water. After the water comes to a boil, “clean” the beef by boiling the beef until all the icky brown gunk and particles come out. Strain the meat and dump out the dirty water. Saute onions, tomatoes, ginger, and garlic in the pressure cooker with EVOO. After the veggies are down, stir in the chili bean paste. After the paste is evenly dispersed, add the “clean” beef, star anise pieces, and soy sauce. Pour enough water to the highest allowed point of the pressure cooker (around 5-7 cups). Add in the green onion stalks, cover and lock the pressure cooker, and cook on medium-high for at least 1 hour (no more than 1.5 hours). The onions and tomatoes should have disintegrated or at least become extremely soft. In a separate pot, boil the noodles and strain. Boil the bok choy for 2 minutes and strain. 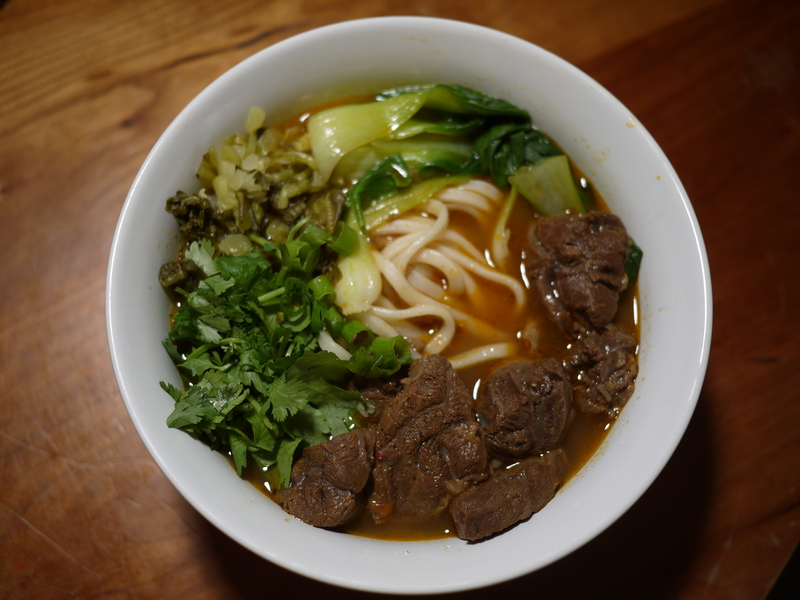 Assemble the noodles and bok choy in a bowl, ladle the soup and meat, and garnish with cilantro and chopped mustard greens.